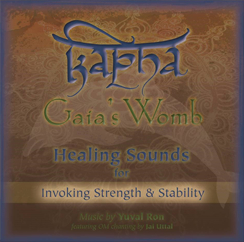 Kapha - Gaia's Womb: Healing Sounds for Invoking Strength & Stability is inspired by and created to help harmonize the Dosha known as Kapha. An important, fundamental aspect of Ayurvedic medicine, Kapha governs the structure of the body and it's overall stability & protection. Dr. Richard Gold and composer Yuval Ron offer this music as a powerful healing force. This music effects all aspects of a person, promoting their well being and health emotionally, spiritually and physically. Recommended for: Yoga, Meditation, deep relaxation, enhancing of healing sessions, Ayurveduc treatments, massage therapy, acupuncture, enhancing of intimacy, sexuality, mental focus, artistic inspiration. Harmonizing the Kapha Dosha can be of benefit in conditions of excess body weight, excessive mucous and sinus congestion, difficulty getting up in the morning, lethargy and lacking inspiration to make changes.